Prominent & Leading Service Provider from Navi Mumbai, we offer industrial chimneys. Chimney Height (feet) Based on customer requirement . We offer a wide range of Industrial Chimneys also known as SelfSupportedChimneys. 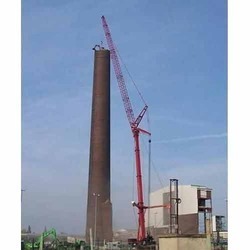 Industrial Chimneys are designed as per the user requirement. We offer these chimneys in various types. These Industrial Chimneys are manufactured using qualitative raw material that is sourced from trusted vendors of the industry. They are available in Mild Steel, Stainless Steel, Carbon Steel and at very reasonable rates. We can design and manufactures chimneys that are most safe and durable. Our range of air pollution control equipment is totaling environmental friendly and for removal of harmful gases/fumes from the process.